I recently had the pleasure of visiting Terre Bleu Lavender farm on the invitation of the makers of Pine-Sol. That's right, Pine-Sol. What does an old school piney-scented cleaning solution have to do with lavender? Well, that's the latest scent for this tried and trusted brand. The lunch itself was spectacularly delicious. I believe it was the work of Daniel et Daniel in Toronto. The banquet table was set with white snapdragons and everyone sipped lavender lemonade. 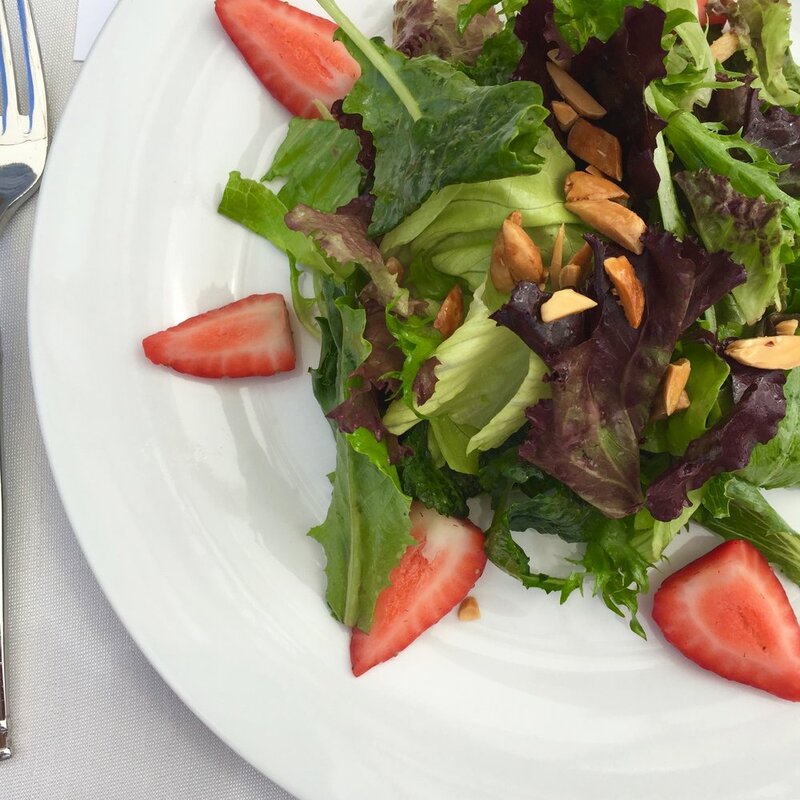 First course was a pretty salad of mixed greens with nuts, berries and a divine vinaigrette. The main was delicious salmon with the prettiest tastiest little potatoes and steamed veg. And to finish, the natural and oh so summery combo of lemon tart with lavender ice cream (natch). During the lunch we are regaled with facts about product development and specifically the rounds and rounds of testing, focus grouping and re-testing it takes to perfect a scented product. Getting the scent right is one thing but getting the scent right and making sure the product still performs as expected is quite another. I was interested to learn that there are many different lavender scents. Some are sweeter and more powdery, some a bit spicy and some a bit minty (lavender is related to mint). The style of lavender scent that the public favours varies over the years. It's why some of us associate that powdery version of lavender with our grandmothers. Because in that era, that's the version that was popular. After the luncheon, Terre Bleu proprietor Ian Baird led a tour of the farm and filled us in on the operation, its 37,000 lavender plants and their wondrous powers. Terre Bleu also operates as an apiary and horse farm. I very much appreciated Ian's sartorial splendor. Nice kicks Ian! This, unfortunately, is not a photo from the day I visited but just look at it and take a deep breath. The day I visited many of the brilliant purple blooms had already been harvested (harvest begins in July) and we were in the middle of a draught. The main building houses a lovely shop and is a fantastic modern barn design. Terre Bleu still looks and smells gorgeous despite the draught. Getting close up to the blooms you can hear the hum of many many bees doing their thing. According to Ian Baird, the presence of the bees also helps protect the plants from stomping human visitors. That day I took home some Pine-Sol to try. I can say it smells wonderful but I haven't put it to work yet.